The name Mossley originates from the words moss meaning a boggy area and lea meaning a clearing in a wood. At one time much of the area would have been thickly wooded, with wild animals such as boars roaming. There have been people living in the Mossley area for thousands of years. A stone-age axe and arrow heads were found on the hillside above Top Mossley. 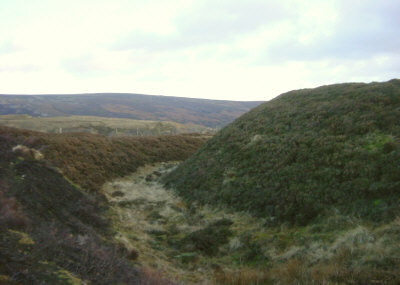 An ancient road runs high along the eastern side of the valley above Micklehurst, and this was improved by the Romans, who used to travel between forts at Melandra and Castleshaw. Another Roman route through the area made use of an ancient track running along the ridge from Stalybridge over Luzley to Mossley Cross, then across Brookbottom to Quick Edge and Lydgate. Travellers kept away from the valley bottom, which was frequently marshy. High on the eastern sky-line of Mossley, above the ancient road, is Buckton Castle. The remains of the defensive ridge and ditch are still to be seen. It had been thought to be an iron age hill fort, but recent archaological explorations by Manchester University have found the bases of stone walls as well as 12th century pottery and handmade iron nails The castle may have been built in the 12th century for Ranulph, 2nd Earl of Chester. The archaology suggests that there was a substantial stone structure with walls around 8 feet thick and 15 feet high, with a gateway tower at its entrance with a room above. This is thought to have collapsed around 1200 AD. Before it became a borough in 1885, Mossley was divided between three counties. Brookbottom (Top Mossley) and Bottoms (Bottom Mossley) were in Lancashire. This part of the town was historically part of the old parish of Ashton. Quickedge, Milton and Roughtown were in the West Riding of Yorkshire. The part to the east of the River Tame, including Micklehurst, was in Cheshire. The borough became part of Lancashire until 1974, when it became part of the Metropolitan Borough of Tameside. Below Buckton Castle, and forming a boundary between the steep moorland and the enclosed fields, an ancient road way runs around the hillside. The Romans made use of this road and paved part of it, using it as a route between the camps of Melandra (Glossop) and Castleshaw (Saddleworth). The area was at one time densely forested but over many years, the trees were mostly felled and the hillsides used to graze sheep. Wool production became the chief industry, with many weaver's cottages being built, incorporating a weaving room. When powered looms were invented, woollen mills and later, cotton mills were constructed in the valley. The earliest settlements in the area, such as Brookbottom and Roughtown, were high above the valley of the River Tame. 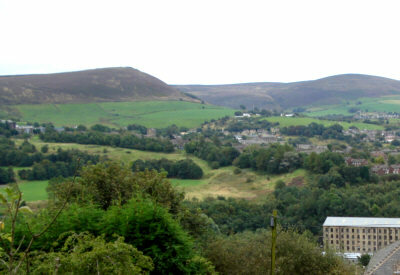 With the building of the canal and later the railway, along with the mills being constructed along the valley bottom, Mossley spread out to fill the valley. Although textile production has ceased, many of the mills are now used for other purposes, while others have been replaced by modern factories. There is still much light industry in Mossley, but many former industrial sites have now given way to housing. Many residents now work outside Mossley with some commuting to Manchester. Mossley has a well-used railway station and the Huddersfield Narrow Canal, closed for fifty years, has recently been re-opened.